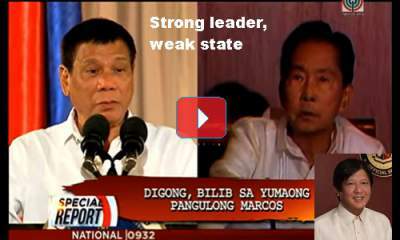 The Liberal Party members should realize now that getting rid of former Vice President Jejomar Binay that leads to the victory of President Du30 is now their greatest nightmare in blocking the leadership of Bongbong Marcos who is his father’s (Ferdinand Marcos) namesake. Aside from his bravery, the people are behind him. [VIDEO]: The President says former president Ferdinand Marcos’ declaration of martial law was ‘very good.’ This is in response to a question seeking to clarify Du30’s earlier statement, where he said that his declaration of martial law would be similar to Marcos’ time. The end-year extension of martial law in Mindanao reflects his huge political support. 94 percent of the 259 members of the House of Representatives voted for it. It might be not because they believed it would be good for the country, but because they trusted Du30. It’s him who told them that it would protect the people. Only 14 were against it, members of the party-list parties that are fronts of the Communist Party. The President’s 78 percent “satisfaction” (net +66), according to the Social Weather Station survey, is the highest since Aquino, for a President in his or her first year of office. Pulse Asia’s “approval” rating was higher, at 84 percent. These are indications of his utmost popularity. The black media propaganda that lasts more than a decade against the Marcoses cannot convince 100% of Filipinos to embrace the possible presidential bid of Bongbong Marcos in the future. However, people from the golden age themselves will not keep quiet about it. They will continue the battle for the truth through the social media. Robredo, who ran for the Vice Presidency just to block Bongbong Marcos from the executive office is now bound to fail. Aside from the ongoing election protest against her, there’s also a possibility that she will be impeached. She keeps a low profile now in criticizing both the President and Marcos. But the Marcos loyalists are always on guard whenever she opens her mouth to discredit both.